The morning after Thanksgiving, my boyfriend and I ventured out of our hotel in Charlottesville, Virginia to find a place serving breakfast (well, really brunch by the time we woke up, but it was a Friday). As one might expect, most of the local restaurants were closed for the holidays. But we found a pub (yet another new establishment that has opened since the last time I visited) that was open and serving food, and that sounded good enough to us! 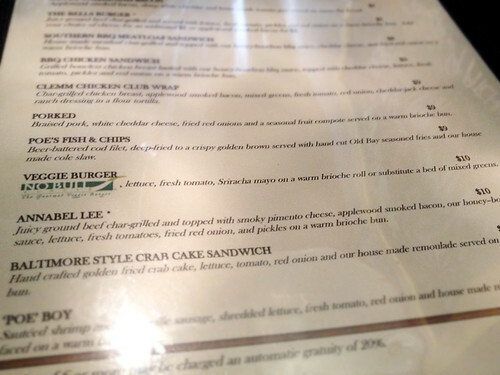 Yup, Poe’s Public House is named after that Poe – Edgar Allen himself. There was a lot of tacky signage referencing the poet, and particularly celebrating the fact that he dropped out of the University of Virginia (this pub is right across the street from the university). So you can pretty well imagine that when students aren’t away for the holidays, this pub is frequented by heavy-drinking frat boys more than studious poets. 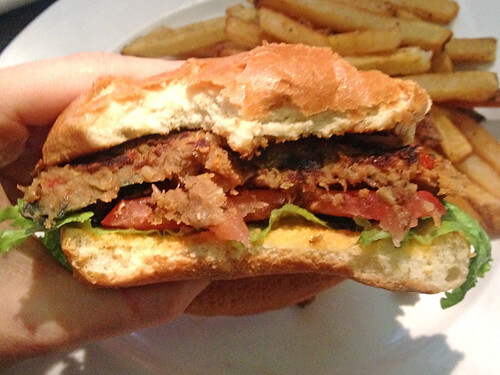 There were not a lot of vegetarian choices on the menu – but I got excited when I saw that they had a veggie burger made with a No Bull veggie patty! 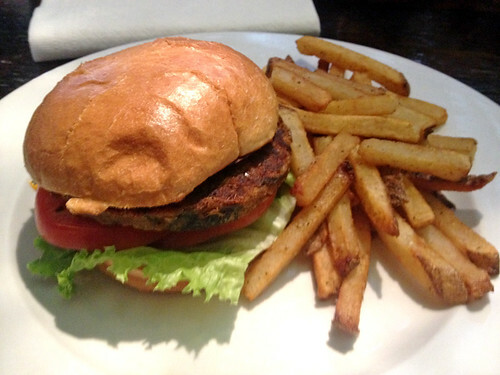 Served on a brioche roll (not the best brioche I’ve ever had, but it was okay for a pub) the burger was topped with fresh lettuce, tomato, and Sriracha mayo. The mayo gave a nice kick of spice to what was otherwise a pretty standard pairing of bun and toppings. But patty itself was delicious, as expected! Once again, I was distracted by my burger and forgot to take a photo of the pub itself. Oops! I promise I will be more diligent about documenting each restaurant I visit on my upcoming trip to Los Angeles! I've never heard of No Bull burgers. Must investigate!